One thing that my family loves to do is watch a good movie together. For me, as a mom I love being able to watch a movie that is family friendly. It is important for me to find movies that are entertaining but also something I don't care if my children are exposed to. 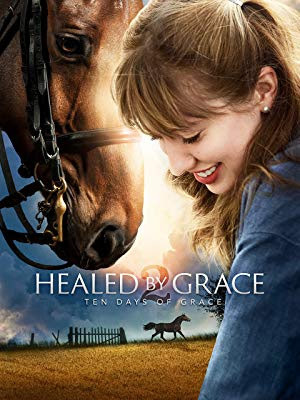 Healed by Grace 2 is Dove Approved for all ages and perfect for the whole family to watch together. Healed by Grace 2 is available on digital format and releases on DVD 9/18/2018. During my review I received a digital screener version with was enjoyed by all in my family. Jesse is approaching her 15th birthday and the only gift she desires is a horse. Unbeknownst to Jesse, her mother Brandy is in the throes of a cancer diagnosis which has Jesse’s father jumping through unexpected obstacles. He signs Jesse up for summer camp, but when summer camp falls through he decides to have her stay with her estranged grandfather, an old gruff horse trainer named Gauff. Gauff, still recovering from the death of a special horse named Grace, now faces the challenges of teen negotiation. Gauff finds he must swallow his pride and ask his daughter Brandy for forgiveness. A humorous and inspiring story of how God’s grace works in mysterious ways. I want you to meet Grace. In the movie Healed by Grace 2 Jesse’s mother Brandy is estranged from her father. During the movie, Jesse’s father drops her off to spend a few weeks with her grandfather whom she has never met. Her father does this because her mother Brandy is going through a cancer scare and Jesse is unaware of what is going on with her mother. During their time together her grandfather Gauff has to come to terms with how he was as a father. He prays for forgiveness and apologizes. When Brandy arrives to get pick up Jesse, she does not want to leave which in returns opens the door for Brandy and her father Gauff to talk, forgive, and reunite. I love how this movie teaches you to forgive, reconnect, and grow through faith. Healed by Grace and Healed by Grace 2 DVD Set Giveaway. For all her life, Riley Adams has dreamed of being a world-class dancer. Victory in regional competition has gained her a coveted spot at the nationals, but a horrific accident brings her dreams to a standstill. She is faced with the greatest setback of her life, yet Riley clings to her faith, determined to recover in time for the national competition. Turning to equine therapy to regain mobility, she discovers a special bond with a beautiful mare named Grace, and a most unexpected burgeoning romance as well! Just when it seems the old Riley is back, disaster strikes and it seems all her efforts will come to nothing. That is until God's grace appears from a most unexpected place. Jesse is approaching her 15th birthday and the only gift she desires is a horse. Unbeknownst to Jesse, her mother Brandy is in the throes of a cancer diagnosis which has Jesse's father jumping through unexpected obstacles. He signs Jesse up for summer camp, but when summer camp falls through he decides to have her stay with her estranged grandfather, an old gruff horse trainer named Gauff. Gauff, still recovering from the death of a special horse named Grace, now faces the challenges of teen negotiation. Gauff finds he must swallow his pride and ask his daughter Brandy for forgiveness. A humorous and inspiring story of how God's grace works in mysterious ways. Disclosure: I was compensated for this post with a product to review by a PR agency or company for my honest opinion. Regardless, I only recommend products or services I use or would use personally and believe will be good for my readers. Your opinions may vary from my opinions. Links in the post above may contain affiliate links. You can also go here and read my PR and Disclosure Policies. Giveaway will end on Sunday, September 9, 2018, at midnight. Giveaway is ONLY open to the USA. I will notify the winner via email within 24 hours of the giveaway ending. I will use random.org to draw the winner. The winner has 48 hours to email me back upon the 48 hours with no message I will draw a new winner. It is up to the company offering the giveaway to fulfill the prize won. I think I would like the story line of falling and building back up. It would speak to a lot of people in many situations. I like a movie that has ups and downs, and good meaning in it. The movie sounds like a very touching emotional one I know I would enjoy for sure. I see there are horses in it too and we have a farm and enjoy horses. I would enjoy the grow through faith process the most. I love inspiring and encouraging family movies. It is nice for us to watch on a Friday evening or Sunday afternoon family day. is really cool with wonderful information. There are themes of abandonment, reconciliation and forgiveness, which many of us have had to face. I do enjoy movies that are uplifting!